Was £29.95 - Now £26.96! 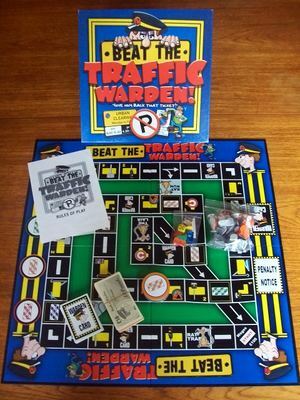 'BEAT THE TRAFFIC WARDEN' BOARD GAME: Ever since September 1960, when the very first parking ticket was given to an unsuspecting doctor on call, it has been a global game not to get a ticket. Now that game has come to life and you can "give him back that ticket!" Even if you have never had a parking ticket, Beat The Traffic Warden will appeal to all as a fun, spirited and enjoyable board game. It is not a game of pure chance: you will need skill, tactical risk taking and determination to beat the traffic warden. Play as either a ticket dodger or the traffic warden. Like new. The box has been opened but the contents are complete and unused.